For such a large city, it's difficult to find good eats in Surrey. Don't get me wrong, there are plenty of good places to eat in Surrey, it's just that everything is so spread out. And honestly, there is a severe lack of info on each individual restaurant. I mean, there are some bloggers that do post about Surrey restaurants, such as Jenny (My Secret Eden) and Mijune (Follow Me Foodie). However, that's about it. So for me, to do any real research, it's quite a struggle. Consequently, I've copied what Kim (I'm Only Here for the Food!) often does - drive around and eat at a random place. Of course, that can be a bit onerous since I was tailed by an RCMP cruiser once while circling in Whalley. 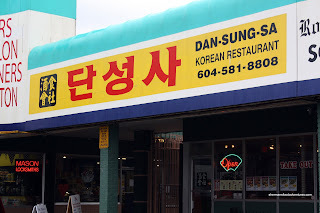 Well, that's exactly what I did, I headed out there and pulled into a random strip mall and there it was: a Korean restaurant just sitting there for me to visit. The place is called Dan Sung Sa. I believe there is a Vancouver location on Thurlow as well. I was there quite early and took whatever table I wanted. 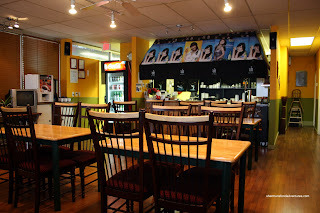 Unlike some recent Korean restaurant misadventures, I was greeted warmly and the owner (?) was quite anxious in seeing that I was happy throughout the meal. Well, it really helped that for the duration, I was the only patron! I was presented with their regular menu as well as their lunch specials. It was a bit confusing that there were Japanese items mixed in with traditional Korean items. I ignored the Japanese food and went straight for their lunch specials. 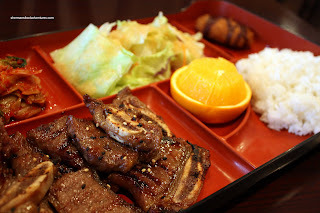 I love BBQ short ribs and gravitated towards the Kalbi Bento Box (yah, a bento box for Korean food, oh well...). For variety purposes, I added a Japchae. What I noticed right away were the prices. 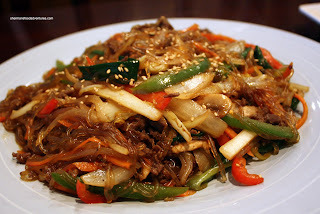 The Japchae is only $10.95! I'm more accustomed with $15.00+. My lunch special cost only $8.95 and included 6 pieces of short rib, rice, Korokke, Kimchi, Green Salad, Miso Soup and Orange. 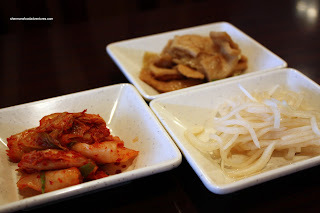 Moreover, as with any other Korean restaurant, I got banchan consisting of more Kimchi, Pickled Daikon and Marinated Tofu Skin. Of course, with any random restaurant, I went in with no expectations whatsoever. Imagine my surprise when the dug into the tender, perfectly grilled short ribs. They were meaty (with not too much fat), sweet, savory and just plain delicious. The Korokke (I know, it's Japanese) was also very well executed. Thicken Worcestershire sauce topped a very crunchy exterior with a soft bechamel centre with corn. Even the rice was perfect being a bit chewy; yet cooked all the way through. If this bento was a surprise, the Japchae was an utter shock. The plate was humongous! Similar in size to the ones I've had at Jang Mo Jib, Insadong and Hanwoori, this one is on average $7.00 cheaper. Not only was it cheaper, the darn thing was well executed. There was no absence of red peppers, onions, carrot, beef and mushrooms swimming in perfectly cooked noodles. These noodles were soft; yet slightly chewy and had just enough moisture that they didn't stick together while not being mushy. Naturally, I was unable to finish it and took most of it to go. This is definitely a place I will visit again.